Welcome to the mean streets of Reno, NV, where the citizens live every day under the protection of the Reno Sheriff's Department. Any city that has a professional, dedicated, and well-trained unit of law enforcement officers watching over it can sleep soundly and know their homes and families are always safe. Luckily for Reno's colorful criminal masterminds, the local Sheriff's Dept. isn't any of those things and you can pretty much get away with anything you want! Don't get us wrong, Lt. Jim Dangle and his band of deputies try their best, it's just that their best is pretty terrible...and come to think of it, they don't really try that hard either. Dangle can't even keep his own bike from getting stolen and the other deputies are usually outsmarted by thieves and vagrants more often than they catch them. But hey, they're better than nothing...barely. 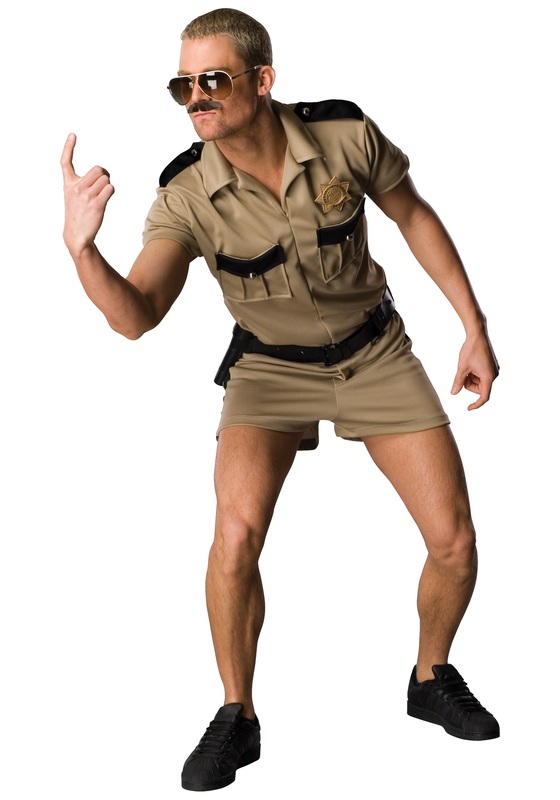 Lt. Dangle might not be great at catching criminals but he can sure rock a pair of hot pants!You might deserve a metal of honor if you are brave enough wear shorty shorts like these in public! If you can rock these short shorts, there's no telling what you are capable of! You'll also get a tan police officer shirt that includes Reno Sheriff's Dept. patches on the shoulders and a plastic gold badge to show you represent the pride of Reno law enforcement. You're sure to keep criminals on their toes, or their roller-skates, or whatever people are on in Reno when you head out as Lt Dangle for your next costumed event. All you need to work on is that lush mustache that this lieutenant rocks. Grow one on your face or pick one out from our selection. Once that's put together, the rough streets of Reno won't know what hit them!